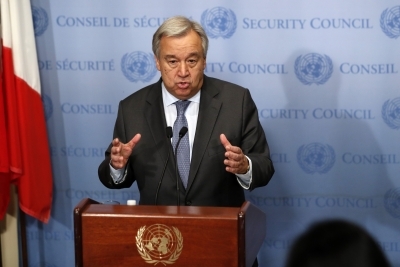 United Nations, Oct 31 (IANS) UN Secretary-General Antonio Guterres on Tuesday deplored the plight of children in armed conflict and called for action to protect them. He called on all parties to conflict to work with the UN to ensure that children are protected, and asked the Security Council to strongly support efforts in this regard. “We see armed groups forcing girls and boys to act as suicide bombers; we see children stigmatized for having been recruited and used by armed groups; we see children held criminally responsible for acts they were forced to commit; and we see parties to conflict often obstructing life-saving aid for children,” he said. “Tens of millions of children across the globe were also uprooted from their homes by fighting — their families often split apart, their childhoods disrupted, their futures put at risk,” he added. The legal framework to protect children in armed conflict is in place, he said, calling on all parties to respect this framework in all conflict situations. He called for accountability for abhorrent crimes and violations of human rights and humanitarian law.